For years the staff of Five Towns Early Learning Center in Inwood, NY, dreamed of introducing the children they serve to a lifelong relationship with nature. In a region where many children have no backyards, this child care center opens it back door so that children may safely run outside to spend time among grass, flowers, and trees. 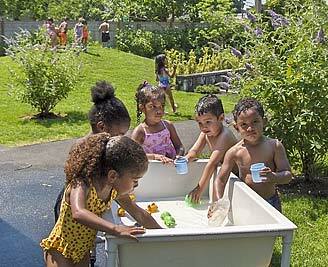 There these children can explore, play, and learn nature’s many lessons. Teachers and children helped plan this space, framed sections for different functions using natural borders and changing ground surface textures. More than a dozen varieties of plants and vines help define boundaries and an area’s purpose. Planners chose low-maintenance materials that would last. A vine-covered arbor attracts children onto a path to the cedar gazebo. There they gather to make music, put on plays, or hear a favorite story. Often they assemble around a wooden table in the Nature Art Area with their Nature Explore-trained teacher to create masterpieces of pinecones and shells. Children enjoy many large-motor activities in the large Open Area, and scrambling up wooden steps in the Climbing and Crawling Area. 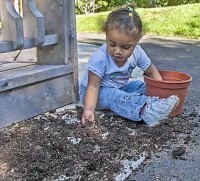 They develop strong tactile skills as they dig in dirt prior to potting plants or placing plants in garden beds. The center held workshops and sent materials home to inspire parents and caregivers. They also shared news of its outdoor classroom through advertisements designed to educate and advocate for including nature in early childhood education. As one of their most whimsical advertisements makes clear, they “make time for children to feel the grass, gaze at the sky and dream”, in their Nature Explore Classroom. It’s hard to say whether the children or their teachers enjoy the outdoor classroom more! 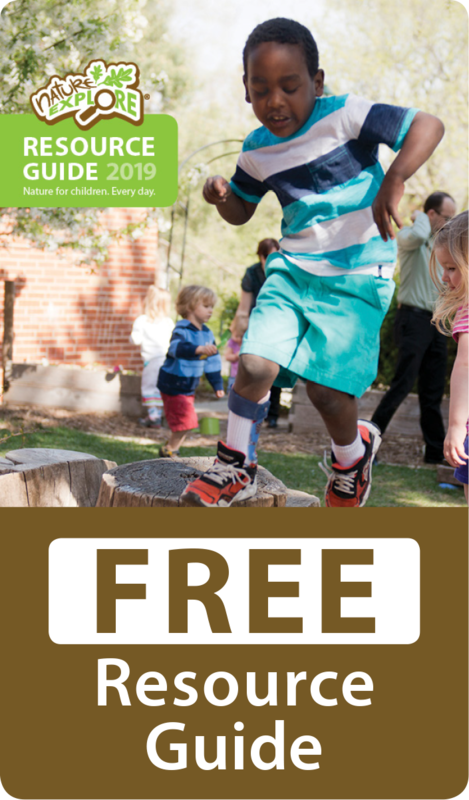 As the children play among the slightly rolling hills marked by flowering dogwood, butterfly bush, or the star magnolia, they all celebrate the stimulation of nature, and enjoy the natural beauty that surrounds them.